These one-of-a kind handmade jewelry boxes are good for rings, small earrings and other treasures. Also a great gift idea! Jewelry boxes are handcrafted by Carroll Garden's designer Karen Levinson. 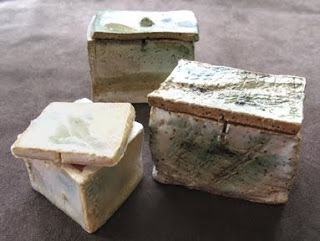 Come in and check out these beautifully sculpted boxes for yourself! That jewelry box looking so beautiful. I really like it. And post me some more desings. Thanks for sharing with me. For the more information visit www(dot)uzbekalive(dot)com.